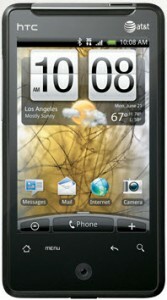 HTC and AT&T in US announced HTC Aria, a premier Android handset for their customers in USA. The HTC Aria is based on Android OS 2.1 with custom HTC Sense UI over it. 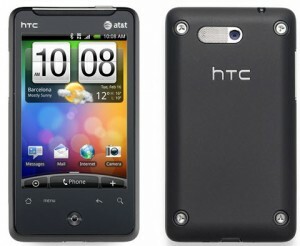 The device can be considered as the android counterpart of the HTC HD mini Windows mobile smartphone. The hardware specification of HTC Aria is almost related to HD mini. However, the Android OS is something what here makes the whole thing different. Available with AT&T’s high speed 3G price plans, HTC Aria makes things easy for its users to stay on track with local weather, social media updates and numerous other services. HTC Sense UI in HTC Aria transforms the traditional Android interface to much user friendly form. He have seen similar implementation in HTC 4G, HTC Desire and all other recent HTC Android phones. There are few widgets, though which users can flip over and select the required services. The home screen of HTC aria shows local weather updates with graphical interpretation. HTC Friend Stream is another useful application included with HTC Aria smartphone. HTC Friend Stream collects updates from Twitter, Facebook, Flickr and arranges them in single window view. Features introduced with Android 2.1, like HTML 5 support, live wallpapers, multi-touch input, new UI and improved speed are also available with HTC Aria. HTC Aria has 3.2 inch a capacitive touch screen with 320 x 480 pixels resolution and support for accelerometer sensor and Proximity sensor. There is an optical trackpad and touch sensitive controls. These features, on a combination with Qualcomm 600 MHz processor will provide excellent gaming, web browsing and multimedia performance. There is 512 MB ROM, 384 MB RAM and card slot that can be used to extend storage up to 32GB; 2GB card included. HTC Aria does well on the imaging side. The 5MP camera comes with LED flash, auto focus, face detection and video recording. HTC Aria is a quad-band GSM and tri-band 3G device that supports most networks in the world. Other specifications of HTC Aria include WiFi, Bluetooth with A2DP, A-GPS, 1200 mAh battery, Google’s applications, full HTML web browser, music player, document reader, etc. HTC will launch HTC Aria in US by 20th June 2010. The device will be available at all retail stores for price of $129.99 after $100 mail-in rebate. Two year agreement and AT&T smartphone data plan is required to avail phone at this rate. There is no information about the launch of HTC Aria in India and other countries. However, we can expect the phone here, around July-August of this year. hey can u just tell me wt is the cost of this mobile? wen it will be there in india specifically in guajarat? becoz i wann buying this mobile? hey can u just tell me wt is the cost of this mobile? wen it will be there in india specifically in tamilnadu? becoz i wann buying this mobile?